Whilst a virtuous bowl of porridge ticks all the right boxes nutrition-wise, it can be a bit of a bore for the taste buds. Here are some tasty tips for topping up your porridge & working towards your 5 a day. Bananas are free of fat, cholesterol and sodium but high in potassium. Simply sprinkle with brown sugar and pop under the grill until the sugar begins to form a crunchy crystallized topping. Then drizzle with cream for that added touch! Warm up your morning by topping your porridge with a spicy cooked fruit delight which is packed with Vitamin C.
Stew apples, cranberries, mixed spice, sugar and a drop of water. Boil and simmer until a gorgeous soft consistency. This can be made in batches in advance and also frozen for those days when there’s not a minute to spare! Add a sprinkle of cinnamon to your porridge whilst cooking. Then top with grated apple for a crunchy topping. Cinnamon is known for its many beneficial properties including its anti-oxidant and anti-microbial qualities. 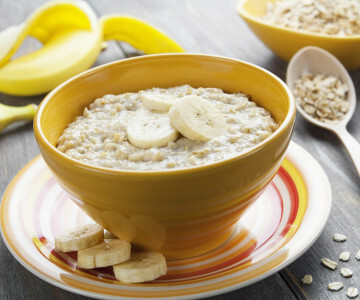 Pep up your porridge with a feast of fibrous delights packed with many health benefits. Add the dates, coconut and a cinnamon stick to your porridge whilst cooking slowly. Once a smooth thick creamy consistency with gooey dates top with pecans for some crunch - and enjoy.